You're in for a world of pampering. 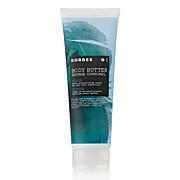 This rich, luxurious body butter is a decadent treat for your tired, dry skin. It helps soften, moisturize and rejuvenate the look and feel of your skin while indulging your senses with the scent of freshly-cut roses. I have never had a bad Korres experience. I have every Korres body butter flavor made. The Japanese Rose completed my collection. This is a very modern Rose scent that makes you close your eyes and say ahhhhh when you smell it. I would love this run in a special again so more people can enjoy it.